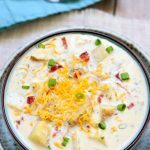 This crockpot soup has a creamy broth, juicy corn kernels, crispy bacon, grated cheddar, tangy cream cheese and sour cream and mild green onions. It is comfort in a bowl and is an easy dinner recipe that takes just minutes to put together. Combine onions, potatoes, broth, garlic powder, parsley, salt, pepper, and red pepper flakes in a large 6 quart slow cooker. Cover and cook on high for 4-5 hours or on low for 7-8 hours, or until potatoes are tender. Turn the slow cooker to high. Cut the cream cheese into cubes and stir into the slow cooker. In a medium bowl, stir together the sour cream and cornstarch. Stir the sour cream mixture into the slow cooker. Crumble the bacon and add it into the slow cooker. Add in cheddar. Adjust seasonings to taste. Ladle into bowls and garnish with green onions. Serve and enjoy!